This record was from the home of Sir George Martin, given as a gift to one of his good friends. 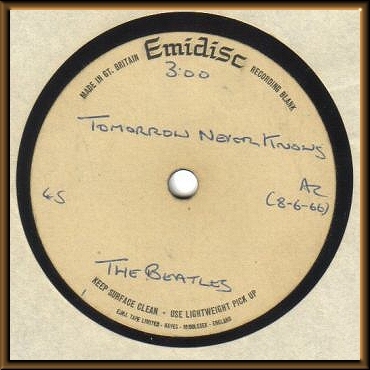 This is an original studio acetate single recording of The Beatles, artists John Lennon, Paul McCartney, Ringo Starr, and George Harrison performing "Tomorrow Never Knows" which according to Beatles information was recorded April 1966 at Studio 3. This version sounds the same as the version on the Revolver album. The back side of this single is flat and smooth. See photo. The date and location information can be confirmed by research in any reputable book or website. 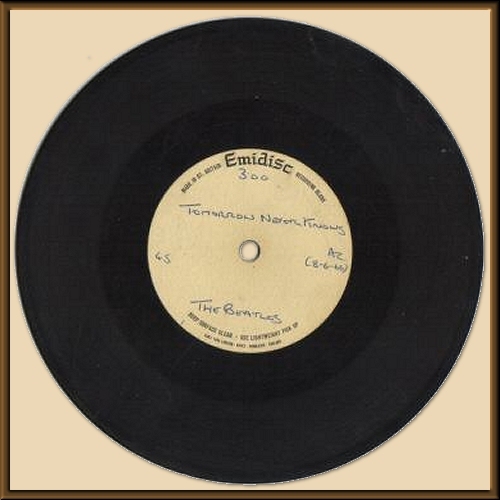 This 45 single recording has the wording "MADE IN GT. 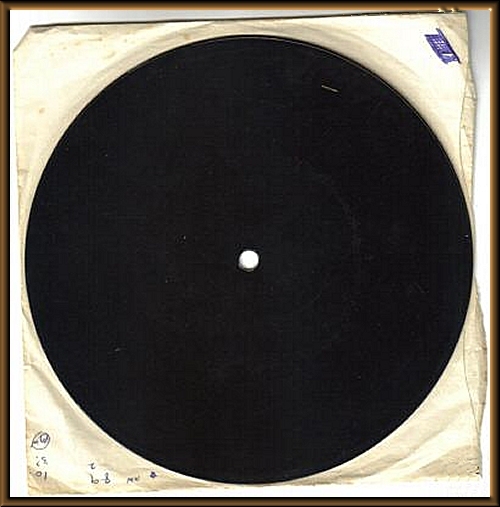 BRITAIN EMIDISC RECORDING BLANK" at the top of the label. In the middle of the label is says "TOMORROW NEVER KNOWS". At the bottom of the label it says "E.M.I. tape limited Hayes Middlesex England". A certificate of authenticity signed by Al Prince. This is 7" in diameter and recording sounds fine but with heavy white noise in the background probably due to the condition of this record... no skips but there are visible scratches however, they do not seem to affect or interrupt the sound other than the white noise and occasional pops which seem to blend in with this kind of song (... if you know this song there are many different kinds of sounds on it). If this auction goes well on this site, the owner will permit me to auction other items from the house of Sir George Martin including Beatles, Seatrain, and Peter Sellers records, so please stay in touch for more information. Current owners of these singles wish to remain anonymous. We represent them in selling this through their attorney. Auction winner can contact us with desired shipping or exchange instructions. If buyer request that this be shipped, insurance is required. Buyer responsible for all shipping and insurance fees. Please send instructions. If desired, exchange can be made at a large bank in Pittsburgh Pennsylvania USA where the record is being held in a safe deposit box. Payment required within 3 days of auction completion if shipping desired. If meeting with us, exchange must take place within 7 days of end of auction. Special thanks go to Al Prince for certifying this. He is a former secondary member of the music group The Four Coins (who had the 1957 hit "Shangri La"), Al became a member later and toured with them on USO and worldwide tours, he is also a songwriter and stage performer for JPAD comedy team. Also, thanks to professional drummer Bill George and researchers Rick Gross, Jacob and James Quigg, Beatles fans Mark and Judy Kramer, and former WJPA DJ Chris Kramer (now owner of Kramer's Greenhouse and Cafe in Burgettstown PA) for advice and guidance. 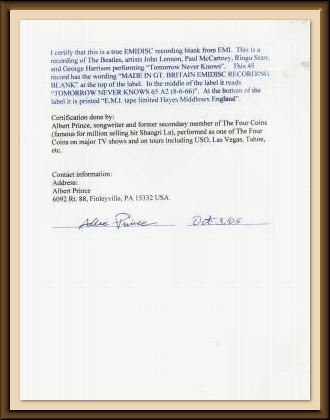 Thanks also to the owners and their attorney of this record for their advice and for trusting us with placing these historic music items up for auction.